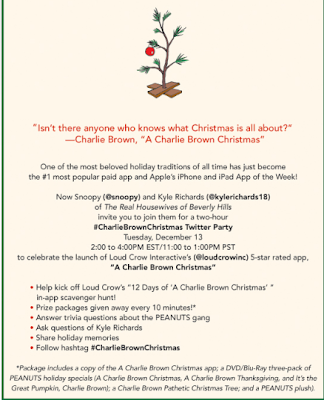 To celebrate Christmas and the new iPhone and iPad app Charlie Brown Christmas, the publisher, Loud Crow Interactive, is having a Twitter party. You are all invited by me to join the Party. Prizes will be given away every 10 minutes during the party. Here are the deets! Join the Twitterverse for a holiday Twitter party @Snoopy & @kylerichards18 on Tues, Dec. 13th 2:00PM to 4:00PM EST/11:00AM to 1:00PM PST; use the hashtag #CharlieBrownChristmas. Prizes will be awarded during the party on Dec. 13th, 2011. Before the party, you can join a giveaway for some Junk Food tees with the Peanuts characters on them, by clicking here if you are on Twitter, and here if you are on Facebook.